James Corum, Ph.D. and Kenneth Corum. 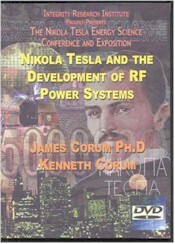 Starting with a brief sketch of his professional credentials, Tesla's RF technology power processing technology is shown in perspective, and his pioneering electrical achievements are framed in modern engineering terms. The presentation includes an overview of the authors' analytical and experimental efforts to replicate and verify Tesla's experiments. Investigations include the slow-wave helical resonator, the directed discharge, the macroscopic particle beam, and the Wardenclyffe project. James Corum is a physics professor, research scientist and inventor. Kenneth Corum is a physicist, teacher and technical consultant.